Note: Whatever happened in last night’s midterm, you can bet that Team SG tied one on. So we thought it only fitting to share a shopping roundup of the best scarves for men the morning after (that we could prepare well in advance), no matter the outcome so that, well, we could sleep in. Enjoy. A good scarf is a case where fashion truly does meet function. The MVP cold weather accessory shields you from wind whipping at your collar, trying to freeze your whole body, Dementor-style…at least until it gets cold enough outside to start wearing your parka that zips up to the tip of your nose. A carefully chosen scarf also completes any cold weather lewk. Like a blue cheese-stuffed olive perched on the edge of a martini, think of scarves as the perfect wardrobe garnish. As for which to wear? The best scarves for men are the ones you feel most comfortable and cozy in. Think: classic plaids, cozy wool, and chunky knits. SG Says: There will always be a place on your coat hanger for a bright red plaid scarf, but this year, why not think about letting some other plaids, like this blue, green, and yellow number, in on the fun? SG Says: Simple. Cozy. Enough said. SG Says: We were reminded last week that sometimes it’s important to provide simple options, not just the busiest trendy pieces of the season. 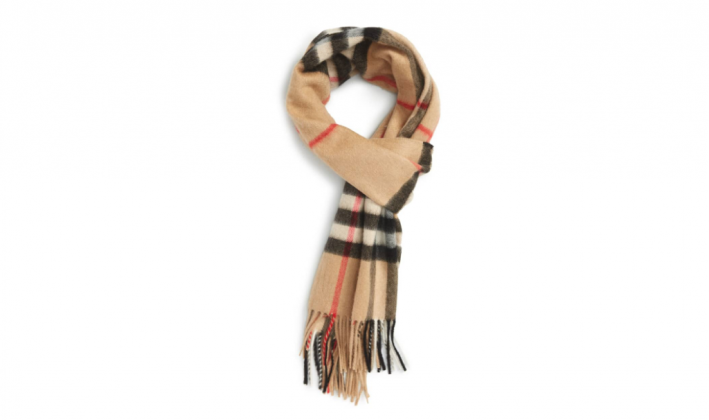 This camel-colored Brooks Brothers scarf is the result of that reminder. SG Says: A hat and a scarf in one fell swoop? You’ll be ready for colder temps in no time! SG Says: This chunky black Donegal number from Naadam has just enough flecks of color for interest and so that people know it’s not just your sweater underneath that’s pilling. SG Says: The plaid flannel made of 90% wool and 10% cashmere is the perfect blend of cozy and refined. SG Says: Founded by Alex Begg in 1869 in Scotland, Begg & Co. brought together skilled weavers and finishers to create hand-woven shawls. Even today, they’re advancing weaving equipment and techniques for products that combine expertise, artisan craftsmanship, and the purest natural fibers. SG Says: Look, do you need a cool, sunglasses-wearing ski jump-skiing teddy bear on your scarf? No. Do you want one after seeing this badass style from Polo? Yeah, yeah ya do. SG Says: You guys have been really loving our picks from Norse Projects recently, and we’ve gotta say…you have good taste. The company’s scarves have been woven in a Scottish mill that dates back to 1797 (meaning, they really know their sh*t). The burgundy and tan shades in this one, made from extra soft wool, would look amazing against a dark topcoat. SG Says: Say it with us one more time…simple doesn’t have to mean boring! SG Says: Fair warning, your girlfriend WILL want to steal this scarf from you. That doesn’t make it any less manly, we promise. SG Says: Sometimes you need to go against the grain when it comes to your accessories. Case in point? This seafoam green and navy-striped number from Saturdays NYC. No one thinks ‘seafoam green’ when they think cold weather, which is exactly what makes it unexpected and fun. WHAT’S YOUR PERSONAL SCARF STYLE?